We call this gorgeous dress our Scarlett O’Hara Dress, but don’t be fooled by the name…this is no costume! This magnificent creation is one our most glamorous designs. It is made from the highest quality burgundy satin with an elegant black sheen. Beneath each tier of burgundy satin skirting is a layer of high quality, delicate black lace making each layer of skirting full and rich. 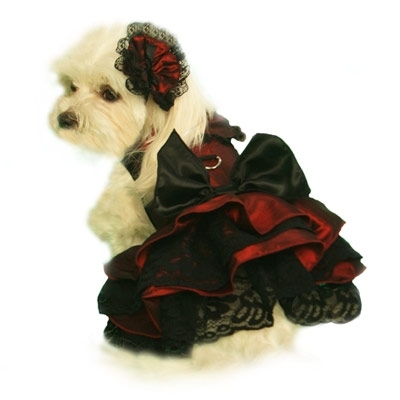 It comes complete with a beautiful matching satin and lace hat and leash.